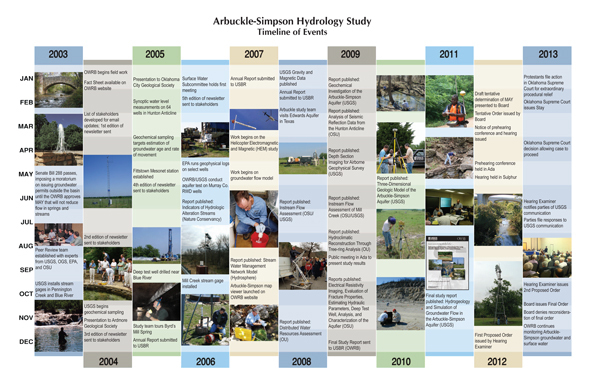 The Arbuckle-Simpson Hydrology Study, which began in 2003, was a multi-disciplinary study of aquifer hydrology and the largest and broadest such investigation ever conducted in Oklahoma. Throughout the study, numerous detailed studies of this south central Oklahoma aquifer were initiated with cooperators, including the U.S. Geological Survey, Oklahoma State University, and University of Oklahoma. Reports submitted to the OWRB (and available on the OWRB's website) have been instrumental in providing details of the aquifer. Among other entities that provided non-monetary support were the U.S. Environmental Protection Agency, Oklahoma Geological Survey, Oklahoma Biological Survey, National Park Service, U.S. Fish and Wildlife Service, rural water districts and municipalities, and many landowners overlying the aquifer. Efforts over the last two years of the study (2010-11) concentrated on finalizing a MODFLOW groundwater-flow model and co-writing a USGS Scientific Investigations Report (SIR). The SIR, titled "Hydrogeology and Simulation of Groundwater Flow in the Arbuckle-Simpson Aquifer, South-Central Oklahoma," was published in September 2011. OWRB staff are currently in the process of determining the acceptable yield from the aquifer that will not deplete the natural flow of springs and streams. The Arbuckle-Simpson Aquifer supplies flow to many area rivers and streams - including Byrd's Mill Spring and the Blue River, the drinking water source for the City of Ada - but more information was required to properly manage and protect the region's water resources. The resulting investigation was the most intensive analysis of surface and groundwater relationships ever conducted in Oklahoma. Study results provide state and local decisionmakers with the necessary information to determine how water resources in the region should best be utilized while protecting area springs and streams, especially in light of a recent proposal to transfer as much as 80,000 acre-feet per year of that water to central Oklahoma. (Several cities and towns in Canadian County have exhibited interest in construction of an 88-mile pipeline to provide future water supply to those communities.) Of particular concern are springs and seeps associated with the Chickasaw National Recreation Area. Congress appropriated funds, cost-shared between the OWRB and federal Bureau of Reclamation, to conduct the study. Characterize the Arbuckle-Simpson aquifer in terms of geologic setting, aquifer boundaries, hydraulic properties, water levels, groundwater flow, recharge, discharge, and water budget. Characterize the area's surface hydrology, including stream and spring discharge, runoff, base flow, and the relationship of surface water to groundwater. Construct a digital groundwater/surface water flow model of the Arbuckle-Simpson aquifer system for use in evaluating the allocation of water rights and simulating management options. Determine the chemical quality of the aquifer and principal streams, identify potential sources of natural contamination, and delineate areas of the aquifer that are most vulnerable to contamination. Construct network stream models of the principal stream systems for use in the allocation of water rights. Propose water management options, consistent with state water laws, that address water rights issues, the potential impacts of pumping on springs and stream base flows, water quality, and water supply development. The Arbuckle-Simpson study will be coordinated by the OWRB, involving participation from dozens of agencies and organizations, as well as private citizens. A technical peer review team consisting of experts from the U.S. Geological Survey, Oklahoma Geological Survey, Oklahoma State University, and EPA will review the scope of work and provide advice to ensure the use of sound science and appropriate methods. The moratorium prohibits municipal and political subdivisions outside the basin from entering into contracts for use of the water and it applies to both pending applications and any revalidation of existing temporary permits. The moratorium will remain in effect until the OWRB completes its study of the Arbuckle-Simpson and approves a maximum annual yield that will not reduce the natural flow of water from springs or streams emanating from the aquifer. Prior to approval of permits for groundwater use within the basin, SB 288 also requires the Water Board to find that the proposed use is not likely to degrade or interfere with springs or streams emanating from the aquifer.